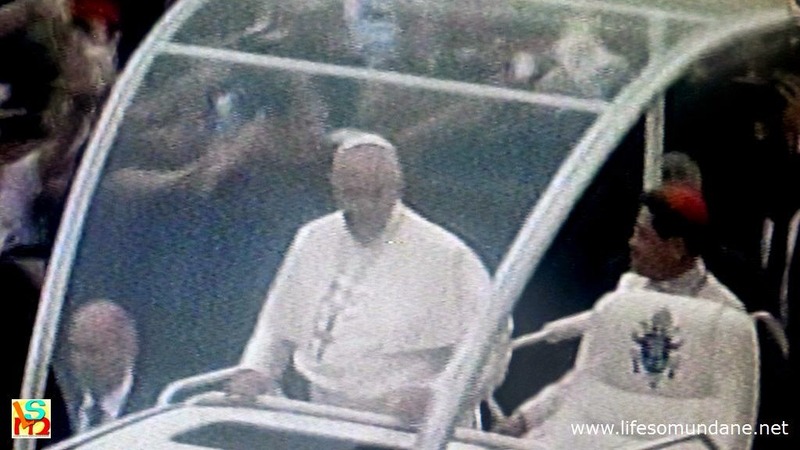 Pope Francis in the Popemobile with Manila's Cardinal Tagle. Before anything else, you will probably think if at all you do bother to read this that the premise of this article is something that can be thought up only by someone with too much time on his hands. To this, I say outright, guilty as charged! But do go ahead and bear with the numbers and you will find things at least fun if not intriguing to ponder. By this time, Pope Francis has landed back in Rome and the euphoria brought on by his visit has begun to subside. Almost obscured by the euphoria was how a pesky weather system named Mekkhala – local name Amang – threatened to spoil the party. Mekkhala, as a matter of fact, was the storm that never should have been, as the succeeding numbers will attempt to show using simple probabilities. From the time St. John Paul II visited Manila in 1995 to attend the World Youth Day celebrations to the start of this year – let us just call it a 20-year period – there was only one storm that threatened the Philippines in the month of January. This was tropical storm Tapah – local name Agaton – in 2002, a 90 kph howler that skirted the eastern shores of the country in a track almost a carbon copy of that taken by Mekkhala. Using this 20-year historical information, then there was just a 5% chance of a storm hitting the Philippines this month, when as we all know the Pope was due to arrive. Because there are 31 days in January, again using straightforward calculations, each day of the month had a 0.16% chance for the Philippines to get hit by a tropical storm. For weather forecasters, it is always something of an educated lottery to determine if a tropical storm that spawns in the Western Pacific will make landfall in Luzon, the Visayas or Mindanao. Thus, the figure gets more intriguing because chances of a storm making landfall in any of the three geographical subdivisions in any day of January lowers to 0.0537%. Now, let us apply the presumptive statistic that a Pope visits the country once in every 20 years. The chances, thus, of a Pope being in the Visayas in the month of January with a storm about to hit lowers to 0.002685%. At this point, I will not burden anyone anymore with numbers; and if there are errors in the calculations, do bear in mind that I used to be a History teacher. Smiley. The point that I am trying to make, however, cannot be lost on anybody. The chances of there being a storm close to Tacloban when Pope Francis was due to visit to commiserate with the victims of Yolanda were close to 0. But Mekkhala did come; and if you are the superstitious sort – and I am – you have every right to wonder if some sinister or evil force sent it to disrupt the Pope’s intention to bring solace to the people of Tacloban. How Mekkhala/Amang subsequently moved, as showed by this track plotted on Google Earth. Now, if you believe in the power of prayer – and I do, profoundly – then you will appreciate it even more how the forecasts pertinent to Mekkhala were going in the background all the time the Pope was in the country. Kudos to PAGASA because it stated from the beginning that Mekkhala in most likelihood would skirt the country’s eastern shores and probably head north and away from where it could do real damage. However, as with Ruby last month, the weather agencies could not agree on a singular track; and most of the foreign agencies predicted landfall for Mekkhala and a track that would take it not only through Leyte but up to Mindoro and Southern Tagalog, including Batangas and probably Metro Manila. Even PAGASA, at one point, revised its track to a more southerly course that would have taken Mekkhala very close to Batangas and Metro Manila. Had the storm stayed true to this track, it would have disrupted not only the Pope’s Tacloban visit but also the Mass at the Quirino grandstand which was attended by a record-breaking crowd. As with Ruby, the cold winds began to blow just at the right time, not only weakening Mekkahala but deflecting it away from where Pope Francis was to celebrate Mass at the Luneta. By early afternoon of Sunday, it was the same latitude as Lipa but 247 kilometres to the east and moving along a northerly track away from Manila. Perhaps, it was the age-old war between good and evil. If indeed a sinister force had sent Mekkhala to disrupt the Pope’s visit, then maybe a Divine force responded by pushing it away. Or, and this is what I personally like to believe, we just saw yet another brilliant demonstration of what collective prayer can do. The Church had called for prayers so that the Pope’s visit would not be ruined by the coming storm. A storm which, as I have shown mathematically, should never have come in the first place. Be that as it may, I like to think that the prayers of the faithful helped to deflect it away.